This exercise increases abdominal control even further. 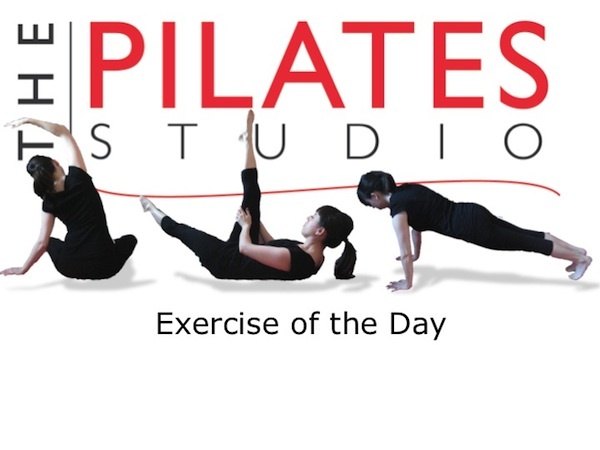 It requires strength to keep the deep abdominals engaged with the challenge of the simultaneous movement of both legs. To do this exercise you will need a mat. Start by lying on your back with your feet in a tabletop position and your hands clasped like a hammock behind your head. Inhale into the ribcage and then exhale as you narrow your ribs, press your ribcage into the ground and the lift your head, neck, and shoulders with the help of your hands. Inhale into the back of your ribs and then exhale as you reinvest in the deep abdominal muscles, then squeeze the inner thighs together and tap the toes on the ground. Inhale as you return the knees to a table top position and exhale as you tap both toes again. Repeat 8-10 times and then on the last exhale gently lower your head, neck, and shoulders to the ground. If you have osteoporosis then you should do this exercise with your head, neck, and shoulders on the ground. You may also place your pelvis on a soft ball to increase the challenge but the head, neck, and shoulders should always be on the ground. The tendency in this very challenging exercise is to allow the pelvis to move which allows the low spine to move farther away from the ground. This is where we find the challenge to the deep abdominals. If you feel your pelvis moving be sure to continue to exhale and pull your sacrum to the ground with those abdominals!